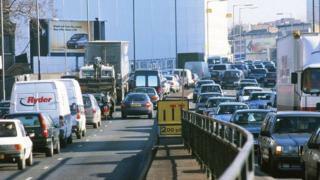 High levels of noise pollution in the capital have been linked to early death and a greater risk of stroke. A study led by the London School of Hygiene & Tropical Medicine (LSHTM) gathered data from 8.6m people across London's 32 boroughs. Scientists found deaths were 4% more common in adults and the elderly where the daytime traffic noise was more than 60dB compared to less than 55dB. Experts said the study did not imply a causal link. Researchers looked at data for people living in London between 2003 and 2010. They analysed road traffic noise levels during the day, between 07:00 and 23:00 and at night, between 23:00 and 07:00. More than 1.6 million people in the city are exposed to road traffic noise levels during the day above 55dB, the level defined by the World Health Organisation as causing health problems. The increase in the number of deaths was most likely to be linked to heart or blood vessel disease, possibly due to increased blood pressure, sleep problems and stress from the noise, they said. Jaana Halonen from LSHTM said: "Our findings contribute to the body of evidence suggesting reductions in traffic noise could be beneficial to our health." Prof Francesco Cappuccio at the University of Warwick said the study was a "welcome addition" to the body of evidence about the role the environment plays in health. "Public health policies must pay more attention to this emerging evidence," he said. He warned the study did not imply a direct cause between noise pollution and early deaths and strokes, but added to evidence suggesting there was a link between the two.